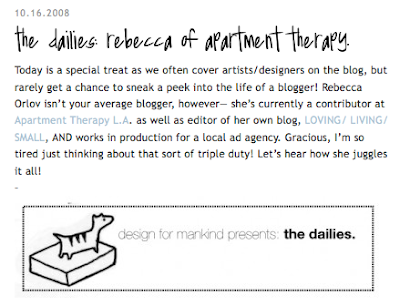 Sweetest blogger, Erin, posted my The Dailies today! Thanks, Erin! 1 Response to "LLS on Design For Mankind"
I just came over from that DfM and I'm SO thrilled to find out about your blog. AT is one of my all time favorite sites and my husband and I are super passionate about small living. We're rehabbing a small shed into a mini house in our spare time. I'm adding you to my reader so I don't miss a thing!